It seems with the all of the advancements made in technology these days, we've lost some of the personal touches that make us human. I was discussing with a friend this past week how the younger generation prefers texting and gift cards over handwritten letters, cards and taking the time to actually hand select a gift for someone. Personally, I prefer to give something I've made from the heart and for me that usually involves baking! Friday was my friend Colleen's birthday and these "Everything but the Kitchen Sink Cookies" are one of her favorite cookies. I can easily see why! They are chock full of goodness - rolled oats, dark chocolate chunks, toasted walnuts, coconut, Special K cereal and dried cherries (which are my own personal touch to the original recipe). Colleen loves these cookies so much she even offered to make curtains for my kitchen in exchange for a batch. So I've renamed the cookies "Everything but the Kitchen Curtain" Cookies in her honor. In a large bowl, combine the coconut, toasted walnut halves, Special K Cereal, oa ts,dark chocolate chips and cherries, Toss to combine. Set aside. In a medium size bowl, sift together the flour, baking soda and salt. Set aside. In the bowl of your electric stand mixer fitted with the paddle attachment (or using your hand mixer), mix the butter, brown sugar and granulated sugar at medium speed until light and fluffy (approx 2 minutes). Beat in the eggs one at a time at low speed mixing well after each addition. Mix in the vanilla extract at low speed until combined. Pour in the chocolate/oatmeal/coconut mixture and fold in the ingredients using a rubber spatula or large spoon until combined. Using a large cookie scoop, place balls of dough onto the prepared baking sheets. Since these are big cookies, I only put 6 balls of dough onto each sheet to prevent overcrowding. Flatten slightly with your fingertips. Bake approximately 12-15 minutes until the edges are browned and the centers look just set (rotate the baking sheets halfway through the baking time). Don't overbake. Remember, the cookies will continue to bake on the baking sheet while they are cooling. Remove from the oven and cool on the baking sheet on a wire cooling rack for approx 3 minutes. Remove from the baking sheet and place on wire cooling rack to cool completely. Or enjoy warm! 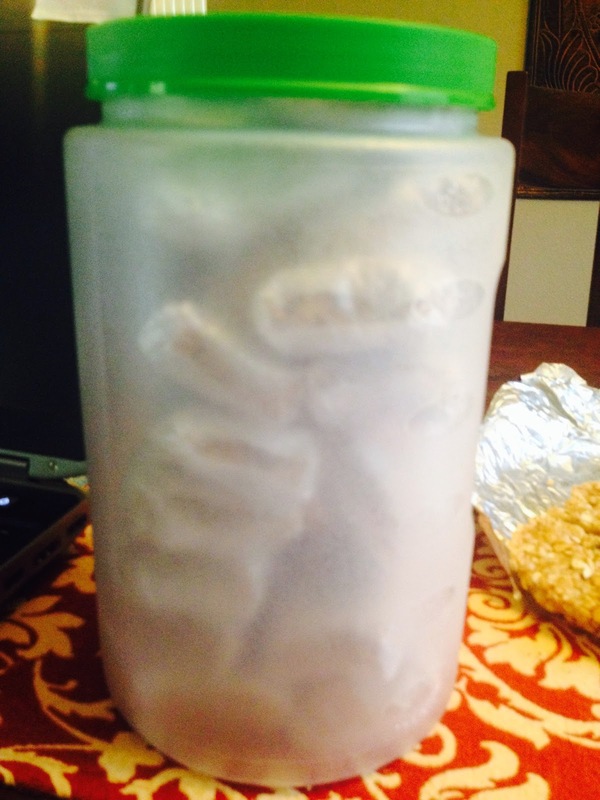 Store leftovers at room temperature in an air tight container for up to 2 days. There are several ingredients in the recipe that are essential to the flavor and texture of these cookies. Please don't skip them! 1. Be sure to use walnut halves and to toast them before baking. The large chunks of walnuts add a lot of crunch to these cookies and toasting them beforehand really enhances the flavor. You will notice the difference! 2. The coconut and Special K cereal are essential to the chewy texture of these cookies. Even if you're not a fan of coconut, you don't even notice it's in there. 3. Definitely use Dark Brown sugar. Again, important to the flavor and texture of the cookie. One last tip - I always bake my cookies on insulated baking sheets. I highly recommend them! They ensure your cookies bake evenly and help to prevent over baking. No more burnt cookie bottoms! Ahhhh...the perfect dessert for a family dinner. Peaches are sooo sweet this year which makes it the perfect time to transform them into a tasty dessert especially since they are usually on sale at most grocery stores. 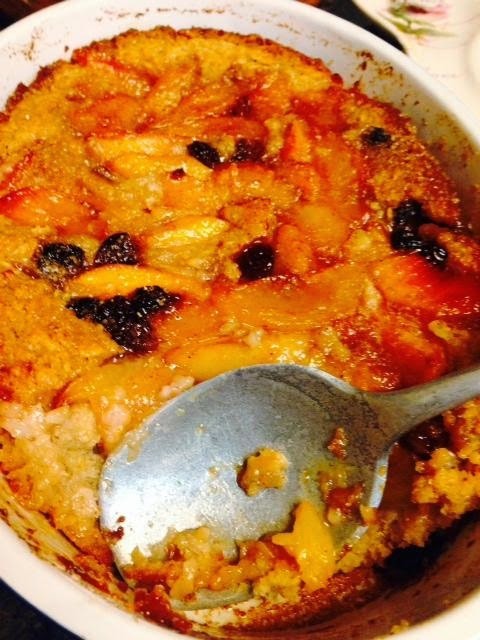 I have made two cobblers this summer. Once when my boyfriend's family was visiting and now tonight by special request from my mother since she had friends visiting from Virginia and wanted me to bring the dessert. 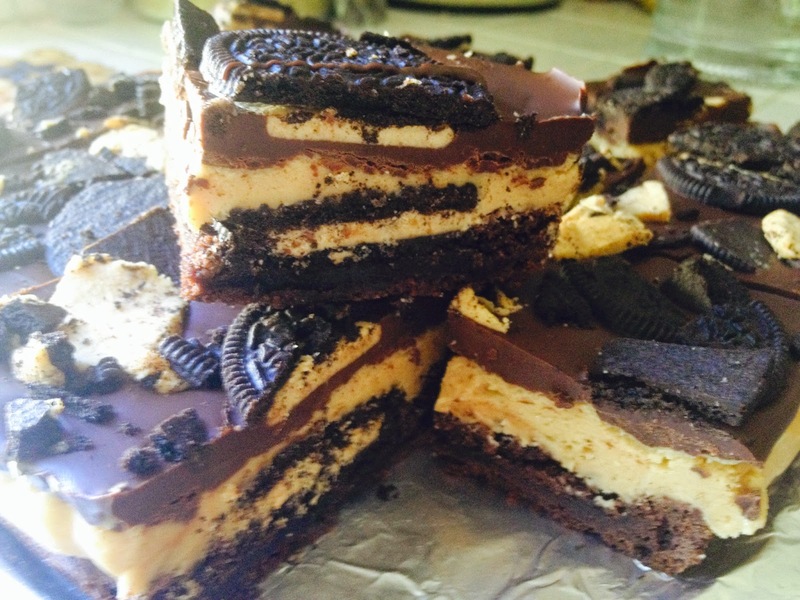 Both times this dessert has been a hit, but this time I think I came up with the perfect combination of flavors . 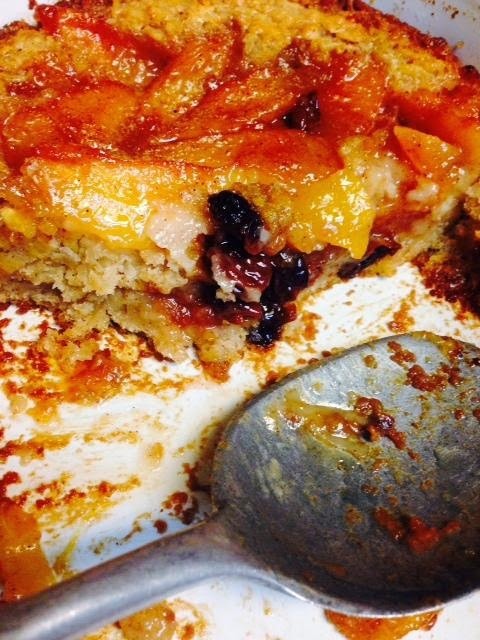 The cake bakes up with a nice golden brown, buttery crust while the cherries add tanginess to the sweet peaches. The contrast in flavors leaves you wanting seconds. I received the thumbs up from my dad, which has always been a tough one to get! My boyfriend also asked for a piece the following day. I hope you give this quick and easy recipe a try for your next family dinner. I guarantee the chef will get a nice round of applause. 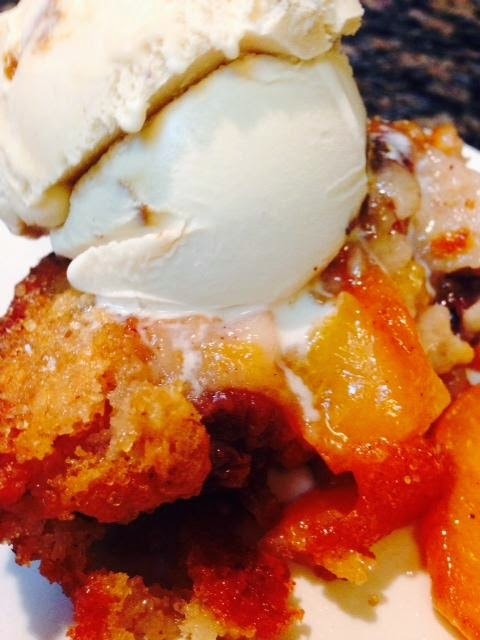 In a medium size pot, add peeled peaches, 1/4 cup sugar , 1/2 teaspoon of cinnamon and 1/4 cup water. Cook over medium heat for 5 minutes till peaches are softened. Remove from heat and add dried cherries. Allow to cool. In a bowl, mix the flour, white sugar, brown sugar, 1/2 teaspoon cinnamon, 1/4 teaspoon salt, 1/8 teaspoon nutmeg and 1/2 cup sweetened flaked coconut. Whisk together. Stir in the milk and vanilla. Add 1/2 cup of old fashioned oats and mix together. Pour the batter over the top of the melted butter. Dollop the peaches/cherry mixture over the batter. Bake for about 50 minutes, remove from the oven and sprinkle with 2-3 tablespoons of turbinado sugar, return to oven and bake for another 10 minutes until the edges of the cobbler are nice and brown. The military will always hold a special place in my heart. My Dad served in the Navy for 30 years and my husband for 24, so I guess you can say I've "been" in the military all my life. While being the daughter and wife of a service-member often comes at great personal sacrifice, I can honestly say I wouldn't have traded the experience for the world! There were countless times when my Dad wasn't there for birthdays, holidays and school functions. He missed a lot of our major milestones, but in spite of having an absentee Dad, through him I learned the meaning of courage. The same can be said for my husband. He wasn't there for the birth of our first child and deployments somehow seemed to fall around the holidays. There were many Christmas mornings spent watching the kids open their presents alone. I can't say you get used to those times, but you do learn ways to cope. Having a husband in the military taught me the meaning of strength. Now that my husband is retired, I still try to find ways to honor both his and my Dad's service and to show support to our Armed Forces out there serving our country, often in harm's way. My heart goes out to the spouses and children of those families. Recently a friend asked me to sponsor a unit stationed in Afghanistan by sending them some homemade baked goods. Of course, I was more than happy to help! I knew I wanted to send something healthy, that could withstand shipping and hopefully still arrive fresh! The healthy option I chose was Peanut Butter and Honey Roasted Almond Granola Bars. Peanut Butter is a great source of protein, the oats a great source of fiber and honey is a healthier sweetener than corn syrup. 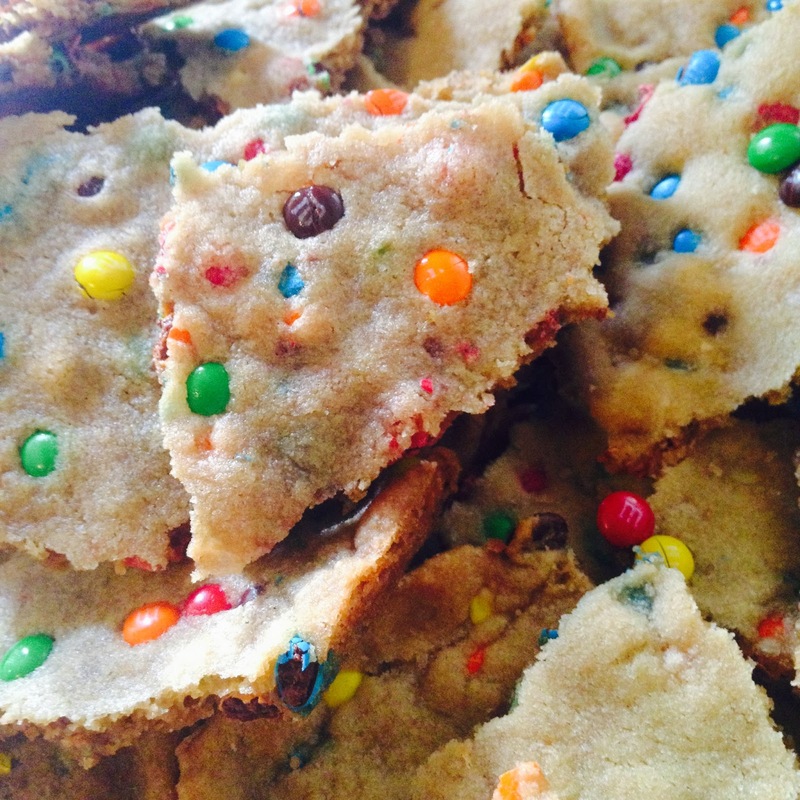 I also wanted to include something a bit more fun like this Mini M&M Cookie Brittle. The fact that this was a brittle instead of a cookie is what sold me. I figured if cookies were going to be hard by the time they were delivered, why not send something that was already intended to be crunchy, like brittle. 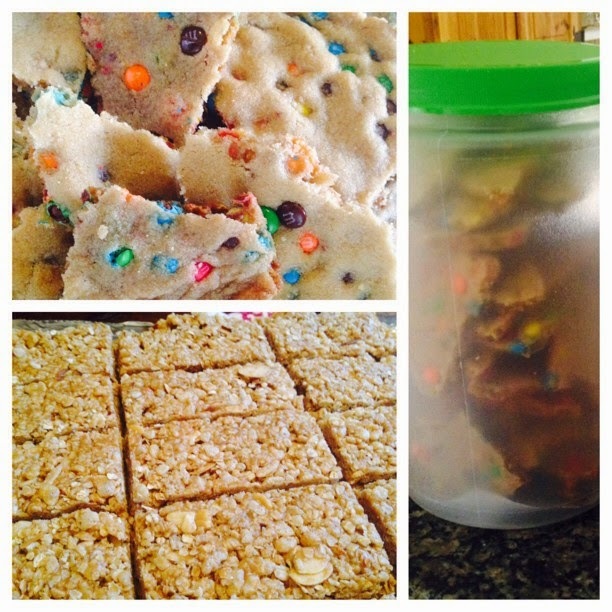 Here's the link to the recipe I used for the M&M Cookie Brittle. It was really easy to make and delicious! Remember, whether you're a baker or not, you can still show your support for the troops in numerous ways. 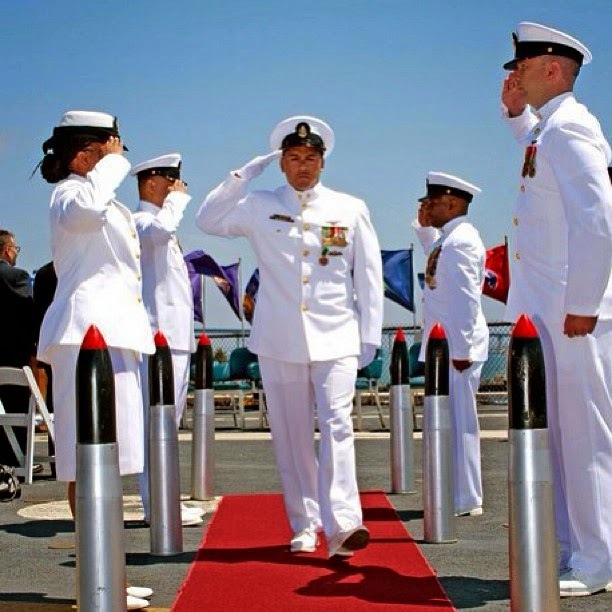 Military.com is a great resource with lots of information. 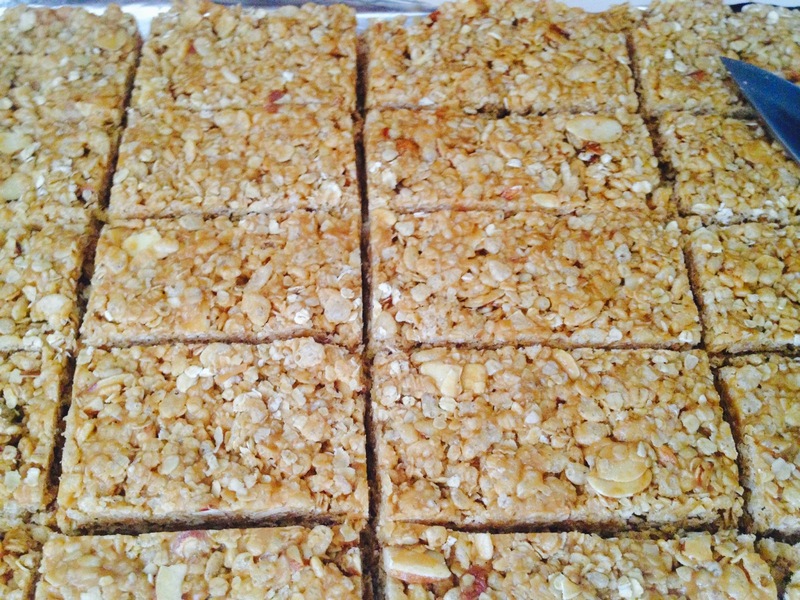 Here's the recipe for the granola bars I made. They're inexpensive, easy to make & don't require any baking! Why not whip up a batch, try them for yourself or send some to the troops? Prepare a 13"x9" baking pan (mine was actually 15" so my bars were a little thinner) by spraying with non-stick spray, lining with non-stick foil or lining with regular foil sprayed with non-stick cooking spray. 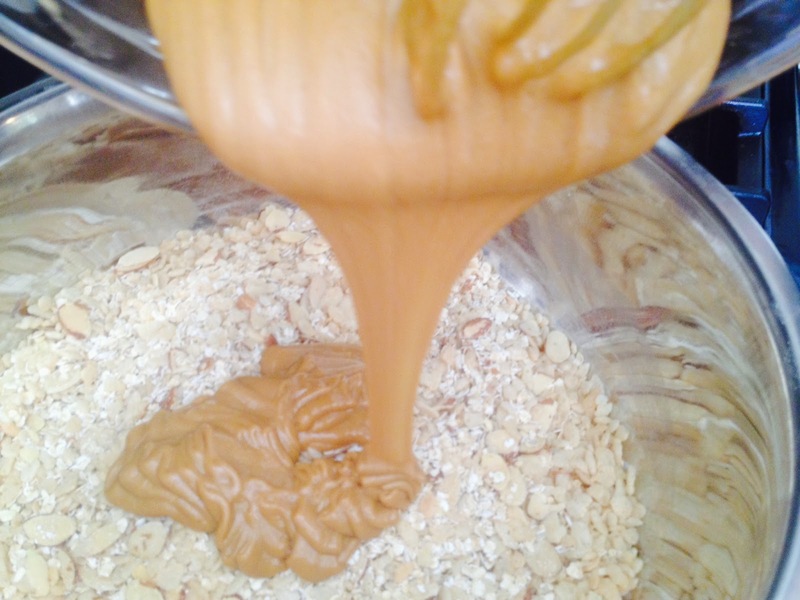 In a large bowl, combine the oats, cereal and almonds. Set aside. Place the peanut butter, brown sugar, honey and salt in a large microwave safe bowl. Heat on high for 1 minute, remove and stir, then heat on high for another minute, stir and heat for another 30 seconds. Remove, add vanilla extract and whisk for 30 seconds or until well combined making sure there are no lumps of brown sugar. Pour the mixture over the oat-cereal-nut mixture, then fold well with a rubber spatula to make sure everything is well coated. Dump the mixture into the prepared pan and press down into an even layer, pressing firmly to compact the mixture. Cover with plastic wrap and place in the refrigerator for a few hours. When well set and firmed up, remove from the fridge and cut into bars. Store tightly covered in the refrigerator or wrap individually and store at room temp for about a week. For shipping, I wrapped the bars individually and stacked them in an air tight container from the Dollar Store. When it comes to comfort food, Salad is usually not at the top of my list. To me, comfort food is usually something warm and substantial, like your favorite cozy blanket. When I've eaten a salad, I usually feel like I haven't eaten anything afterwards and it leaves me wanting more. This salad, however, is different. I find myself craving it. I think it has something to do with all of the roasted veggies - there are over 7 in this salad and you can always add more if you like (think eggplant, butternut squash or red potatoes)! The pasta also helps to make the salad feel like it has body. Add a protein on top (so far I've served it topped with salmon and steak, chicken will be next!) and you've got a complete meal. I know all of the prep work sounds like a lot, but don't let all of the roasting dissuade you from trying this recipe. 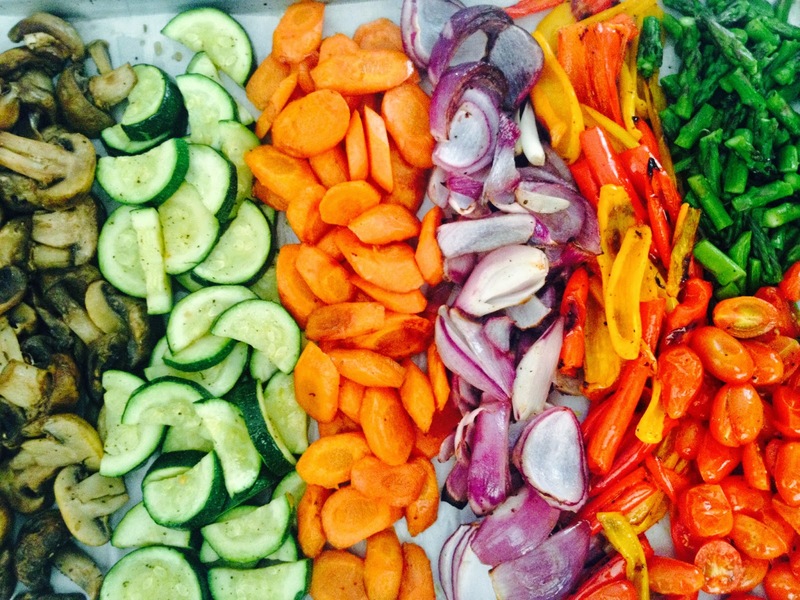 Plan ahead and roast the veggies the morning of or the night before! 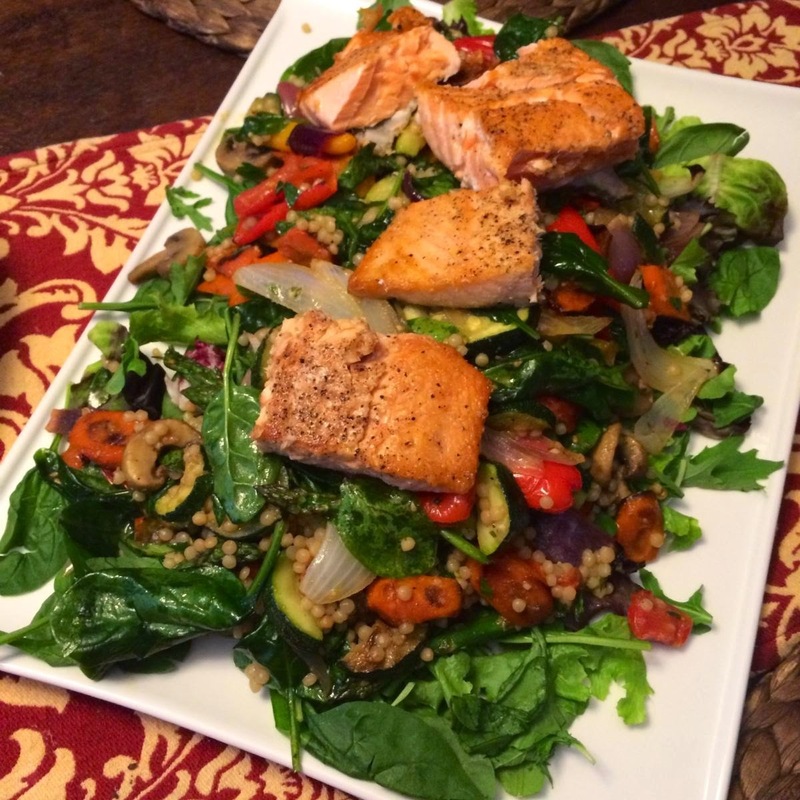 Make the dressing and your protein (if adding) ahead. Then all you need to do is make your pasta, toss and serve! Combine all of the dressing ingredients in a small mason jar and shake well to combine. Refrigerate until ready to serve. ** The dressing recipe makes more than you'll need for the salad. It's a great all-purpose dressing so save the remainder for another use! Line rimmed baking sheets with foil. You'll need about 3-4 baking sheets. If you don't have this many, just roast the veggies in batches. Make sure you like the baking sheets with foil for easy clean-up in between roasting. 1. Place the carrots on one of the foil lined baking sheets. Drizzle with the honey, season with salt & pepper and toss to coat. Roast for 15-20 minutes or until just tender and beginning to caramelize. 2. Place the peppers and onions together on one of the foil lined baking sheets. Drizzle with olive oil and season with salt & pepper. Roast for approx 15-20 minutes or until the peppers and onions are lightly charred. You definitely want char on these veggies for more flavor. 3. Place the zucchini and mushrooms together on one of the foil lined baking sheets. Drizzle with olive oil and season with salt & pepper. Roast for approx 10 minutes or until tender (but not too mushy). 4. Place asparagus on one of the foil lined baking sheets. Drizzle with olive oil and season with salt & pepper. Roast for approx 5 minutes. 5. Place the halved tomatoes on one of the foil lined baking sheets. Drizzle with olive oil and season with salt & pepper. Roast for approx 3 minutes or just until the tomato skins burst. Place all of the roasted veggies in a large bowl or platter. Drain any juices that may have accumulated during roasting. When you are done roasting the veggies, cook the Israeli Couscous according to the package directions. Allow to cool for 10 minutes before assembling the salad. 1. Place the slightly warm Israeli Couscous in a large bowl. Add the spinach and toss. This will help to wilt the spinach a bit. 2. Add half of the dressing and all of the roasted veggies. Toss gently to combine. 1. Use a very large platter (preferably with a rim). If you don't have a platter large enough to fit all of the salad, serve the majority of the salad on the platter then replenish as needed. 2. 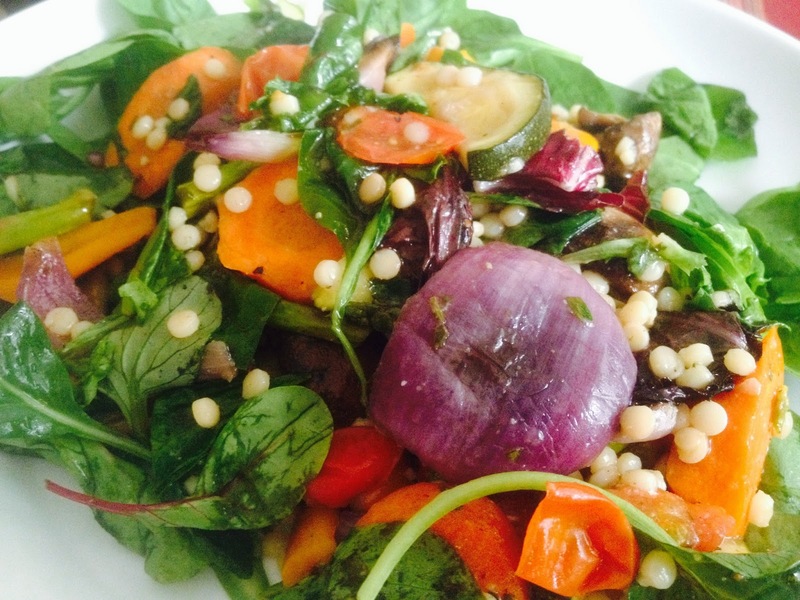 Place the spring mix or field greens on the platter. Carefully arrange the roasted veggie mixture on top of the greens. 3. Top with your protein of choice and serve. Leftovers can be stored in the fridge until the next day. Add additional spring mix or field greens before serving (and top with more dressing if needed). 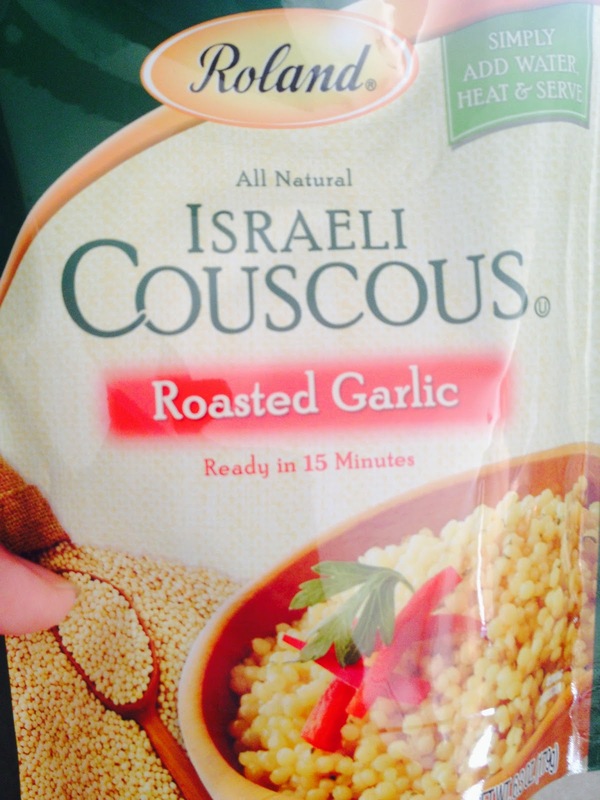 Here's a photo of the Israeli Couscous I used. Feel free to use your favorite. 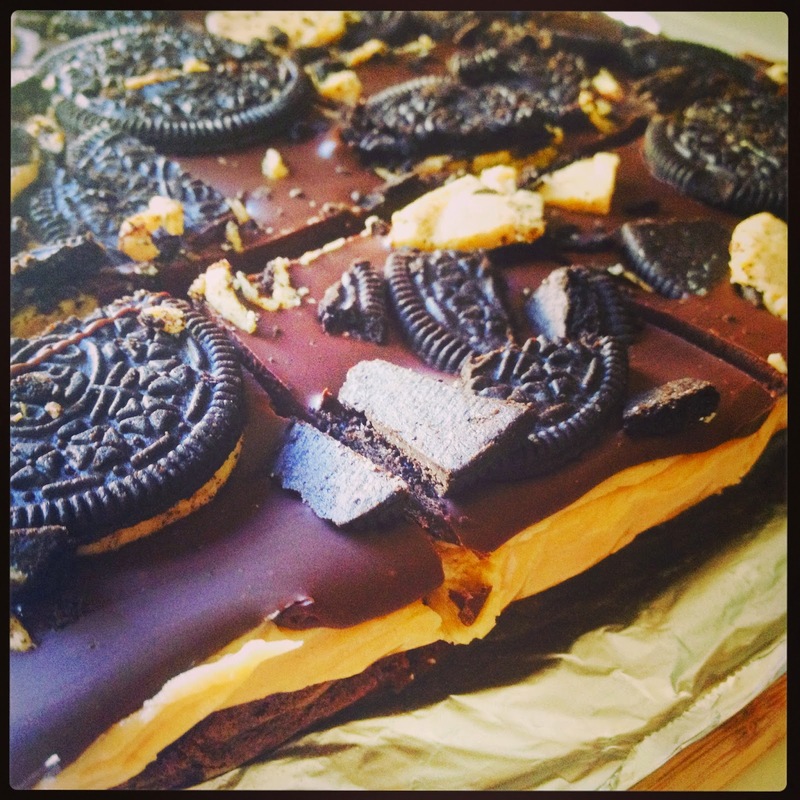 It all starts with a layer of brownie batter that gets topped with Peanut Butter Oreos, followed by a layer of peanut butter "frosting", dark chocolate ganache and more Peanut Butter Oreos. Boy are these good! I hope my partner for this month's Leftover's Club, Michele from Alwayz Bakin enjoys them. They're a little over the top, but that's not a bad thing, is it? If you'd like to join a fun group of fellow bloggers and exchange delicious treats once a month, please head over to Food Ramblings to sign up! Line an 8"x 8" or 9" x 9" baking pan with non-stick foil or spray regular foil with non-stick cooking spray. Prepare your favorite brownie recipe (or boxed mix) according to the directions and bake as directed. 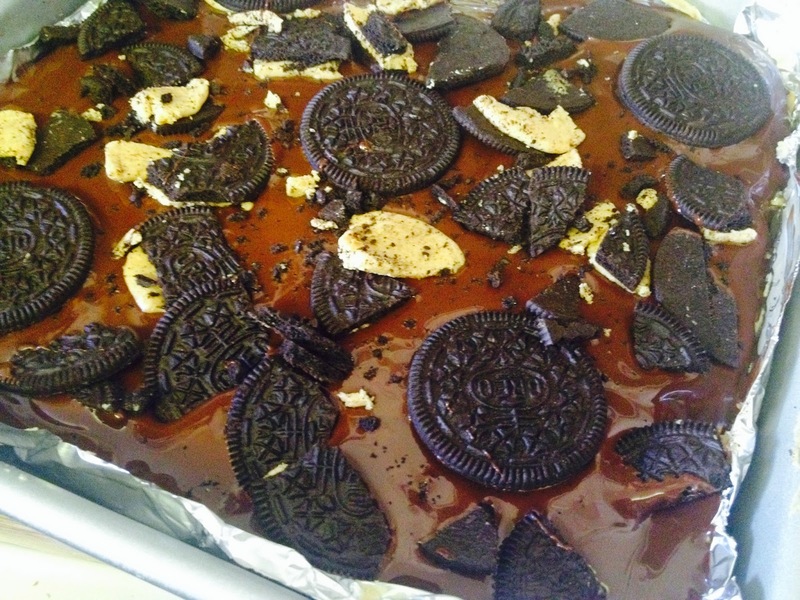 About 8 minutes before the brownies are done, top with the whole and chopped Oreos. Finish baking then remove from oven and allow to cool completely. 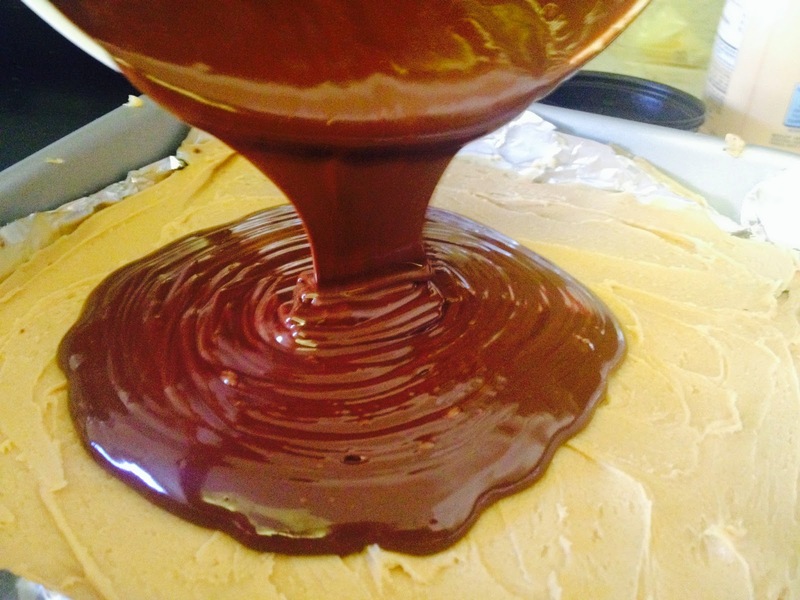 When brownies are completely cooled, prepare the peanut butter layer by combining all of the Peanut Butter Layer ingredients in a large bowl and whisking until well combined. Dollop over the cooled brownies and spread into an even layer. Refrigerate for approx 1 hour or freeze for 30 minutes. When brownies have finished chilling, make the chocolate ganache layer. Melt the chocolate chips in the microwave and stir until completely melted. All the peanut butter and stir to combine. 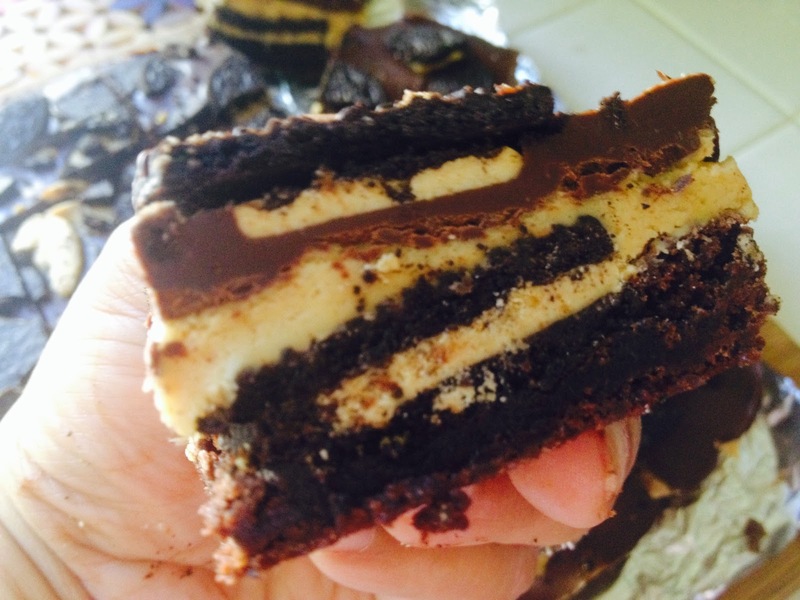 Pour over the chilled peanut butter layer, then top with the whole Oreos and sprinkle with the chopped Oreos pressing slightly to make sure they adhere to the chocolate. Chill in the refrigerator for 20 minutes until chocolate is set and brownies are firm. Cut the brownies into 12 equally sized squares. To serve, allow the brownies to come to room temperature for about 15 minutes. Store leftovers in the refrigerator in a tightly covered container.